Billie (Alyce-Louise Porter) has one of those infectious laughs – there were moments during A State of Mind when I found myself laughing because she was, whether or not I found amusement in what was actually being said. Elsewhere, some of what happens to Billie is far from funny, and in this gritty life story (an abridged one, mind you), I wondered if she was laughing out of nervousness, laughing in the process of recounting something bizarre, or laughing sardonically at either herself or one of her detractors. I suppose it doesn’t really matter, inasmuch as the salient point is that she is laughing, and a merry heart is better than a melancholic one. There’s a bit of growl in her voice, the sort of growl that would be more moderated had this not been a verbatim performance. She finds solace in painting, and her living room, decorated with lights on the floor as though they were candles, gave the performance space the aura of a shrine. Falling pregnant at the age of fifteen, Billie encountered much opposition, particularly from her dismissive mother. Medical professionals were less than kind, too, but worse was still to come. One of the characters in The Lieutenant of Inishmore, a production of which is playing its final weeks in the West End at the time of writing, wonders towards the end of the show when proceedings would just end, given all the tragedy and heartache. One might, had it not been punctuated with so much laughter from its narrator, have had similar sentiments about A State of Mind. Billie enjoyed, and enjoys, the music of David Bowie – going through a number of personal issues at the time of his passing didn’t help matters. In amongst all that went on, Billie finds closure, or tries to find closure, through forgiveness. It’s an intriguing concept – she’s not suggesting that those who did unpalatable and terrible things to her (and to a good friend of hers) shouldn’t face the consequences of their actions, but the act of forgiveness helps her to move on with her life and be at peace. It’s a process that takes time, and it isn’t any wonder that some of the events she describes took place decades ago. 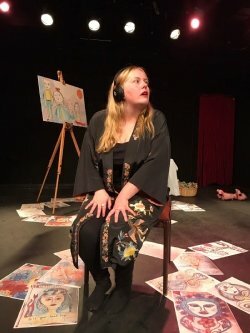 There’s some evocative imagery – when her mother, at an advanced age, stubbornly refuses assistance with washing and dressing during a hospital stay, Billie draws a parallel between that and the inability to wash away her own personal guilt and shame over critical incidents in her life. It’s a monologue as monologues should be: a good rapport with the audience is established and maintained, with a manner so engaging that I wanted to hear what happened next no matter how harrowing the story became. An emotionally charged performance, during which the two faces of theatre, laughing and weeping, become an apt image. Ultimately uplifting, it portrays both strength and vulnerability – this is a highly engaging, and nuanced production. A State of Mind is a Verbatim piece of theatre, meaning every story heard is true. Throughout the piece we use the recorded delivery technique, Alyce will wear headphones throughout and will be listening and sharing the stories on a 3-second delay. Each cough, stutter and breath is reproduced sharing the speech pattern of the interviewee. A one woman verbatim play about the struggles in life and how we overcome them. Dealing with mental health, the use of medicinal and recreational drugs and how relationships form the ways in which we live and share ourselves with others. Billie bares all. The good, the ugly and the downright painful. There is never a dull moment with Billie. She’ll have you laughing and crying through her daringly dark and wonky life! In the UK and around the world mental health problems are a growing public health concern. We can help support mental health problems through different types of therapy, counselling and medication. A State of Mind welcomes you to meet Billie who hopes you will listen to her sharing her story.